A doctrine or body of doctrines of theology and religion formally stated and authoritatively proclaimed by a group. Prevenient Grace – Prevenient grace has reversed the effects of original sin, enabling a person to respond in faith to the gospel. All men receive this grace but they also have the freedom to reject it. Arminius: Man inherits a corrupt nature. Christ removed the condemnation and guilt of original sin so man is condemned by his own sin. Wesley: The gift of prevenient grace gives man the ability to cooperate with God with his free will. Confession of 1566, which gives a clear statement of the Reformed doctrine. 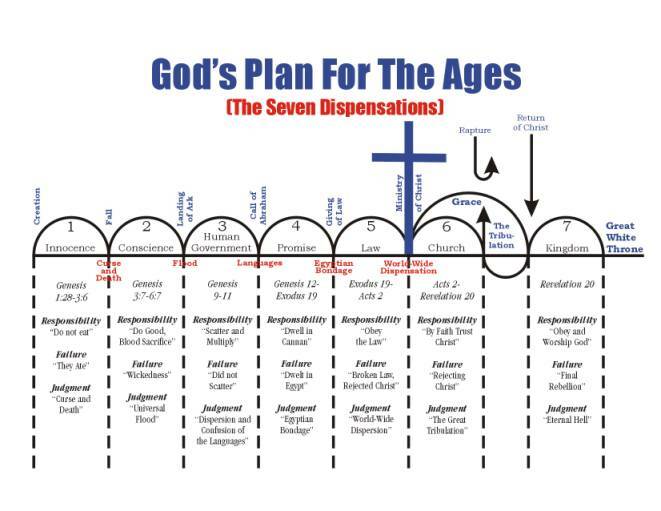 A system of interpreting the Scriptures on the basis of two covenants: the covenant of works and the covenant of grace. Some add the covenant of redemption. Importance of grace – In every age, believers are always saved by grace. God’s primary purpose on earth is redemptive. Literal & Semi-literal or Semi-allegorical system of hermeneutics. Covenant of Works – God entered into a covenant with Adam as the federal head of the human race in which He promised eternal life for obedience and eternal death for disobedience. Covenant of Redemption – A covenant made between God the Father and God the Son in eternity past in which they covenanted together for the redemption of the human race. Covenant of Grace – A covenant made by God with the elect in which He provides salvation to the elect sinner. A system of interpretation that seeks to distinguish differing stewardships whereby man is tested in respect to his obedience to the revealed will of God. 1. God’s primary purpose on earth is doxological. 2. Consistent Literal method of hermeneutics. 3. Distinction between Israel and the Church. 1. The Old Testament - The formulation of a biblical theology from the Old Testament based upon literal interpretation (grammatical-historical method of interpretation) of the Old Testament text. 2. The New Testament - The formulation of a biblical theology from the New Testament based upon literal interpretation (the grammatical-historical method of interpretation) of the New Testament text, which method includes the backgrounds arrived at via point 1 above. Semi-Pelagian – the sin of Adam left him in a weakened condition but not spiritually dead. As a result, man can initiate salvation. Pelagius taught complete free will. Tradition, Church, and Scripture (including apocryphal writings) are authoritative. Council of Trent – 1546; tradition is authoritative, RC church is only interpreter of Scripture, adoption of Latin Vulgate as standard. Bible for preaching and teaching. Church began with Peter – the papacy has the authority of Peter. with Christ], a perpetual virgin, and immune from all sin. unpaid. Here the soul is purged, cleansed, and readied for eternal union with God in Heaven. 7. Anointing the Sick (formerly called Extreme Unction) – Removes infirmity and obstacles left by sin, which prevent soul from glory. Prepares the soul for eternity. Liberalism places a premium on man’s reason and the findings of science. The Bible is an ordinary book (they deny inspiration [e.g. JEDP theory]). Man is basically good (they reject original sin). Christ was an ordinary human (they deny the deity of Christ). Emphasis on the immanence of God, the view that God is everywhere and in everything (they do not distinguish between the natural and the supernatural – hence no miracles). The kingdom will be brought in through human effort (social gospel). Schleiermacher (1763-1834)... Emphasized feeling and experience: father of modern religious liberalism...Rejected the Fall, original sin, Virgin birth, and substitutionary atonement...Sin is interest in the world; faith is feeling, not response to what God says. Ritschl (1822-1889)...Emphasized ethical and practical aspects; his teaching became the ground for the social gospel. Jesus died as a moral example...Rejected original sin, incarnation, deity, atonement, and resurrection of Christ. Denied sin as selfishness. Harnack (1851-1930)...Taught that Paul corrupted the teaching of Jesus and Christianity...Taught “fatherhood of God and brotherhood of man.”...Denied the deity of Christ and His substitutionary atonement...The seeds of Bultmann’s demythologizing is seen in his theolgy. Baur (1792-1860)...Developed the historical-critical method. Emphasized the historical evolution of the New Testament. The Bible is full of myths...Denied revelation, incarnation, and bodily resurrection of Christ...Taught Christianity was a conflict between Jewish (Peter) and Gentile (Paul) factions. He was a student of Mark Strauss. Bushnell (1802-1876)...Children are born good and can be taught to grow into Christianity...Opposed sudden conversions...Denied substitutionary atonement of Christ; His death was only an example. Rauschenbush (1861-1918)...Emphasized the social gospel; Jesus’ love would transform society...Taught the gospel is social concern, collective ownership of property (criticized capitalism), and equal distribution of goods...Rejected substitutionary atonement of Christ, His second coming, and a literal hell. Salvation is through Jesus’ love. Man was basically good, but they were not interested in building a utopian earth. They acknowledge the problem of sin but denied original sin and total depravity. Christ, but acknowledge that through JC’s death the church is infused with the power of God. Soren Kierkegaard (1813-1855)...Dane; founder of existentialism (emphasis on the spiritual encounter; it stresses the personal experience). Knowledge unimportant. Subjective experience is important. Salvation is a commitment to God in a blind “leap of faith” amid one’s despair. Emphasized transcendence of God; God cannot be known through “proofs.” Christ of history is unimportant one must experience Him in the present. Historicity of biblical events is unimportant. Reinhold Niebuhr (1892-1971)...Union Theological Seminar. Sin is basically social; society needs to be transformed from capitalistic greed. Man’s need of social justice must be advocated. Rejected liberal view of man’s goodness.  Rejected historic view of sin and historicity of Adam. Not as conservative or biblical as Barth and Brunner. Paul Tillich (1886-1966)...Union Theological, Harvard and University of Chicago. He stood between liberal and neoorthodoxy theology. He would be more of a radical neoorthodoxy and Barth more conservative. God was not personal but a “ ground of Being.” Sin is an estrangement from one’s true self. Sin is disruption from the gound of his being. Salvation is the New Being evidence in the life of Christ. Christ is not a historical person, but a symbol of the New Being. Tillich is more a philosopher then a theologian. Karl Barth (1886-1968)...Theology must be God-centered, not man-centered. Built on Kierkegaard’s subjective emphasis. Man encounters God in reduplicating the experiences of the biblical writers. Rejected general revelation. Bible is important but he rejected inspiration and inerrancy; Bible is a witness to revelation. Revelation takes place when man receives it. Christ-centered; Christ is the revelation of God and all mankind is elect in Christ. Emil Brunner (1889-1966)...God cannot be known through objective doctrine but through a subjective encounter with Christ. Emphasized a high Christology. God is known personally in an I-Thou relationship. Allows for general revelation. Rejected inspiration of Scripture and reality of hell. Rejected inherited sin and Adam as historical. Man sins because of choice, not inherited nature. Sin is self-centeredness. Denied the virgin birth. Held to incarnation, deity, and resurrection of Christ. The Bible is a witness to the Word of God. The writers of Scripture simply related their spiritual experiences. In reading their account a person can also experience the revelation of God. At that moment the Scripture becomes the Word of God to that person. They reject general revelation (Bible is the only witness). Emphasis on the transcendence of God (He is not knowable). Christ is knowable. A knowledge of Christ is both objective (based on historical events) and subjective (experienced internally by the believer). All mankind is elect in Christ (universalism). Rudolf Bultmann (1884–1976) was the son of an evangelical Lutheran minister. He pursued his theological studies at Tübingen, Berlin, and Marburg, where he became professor of New Testament in 1921 and remained until 1951. It was at Marburg that he became interested in dialectical theology. Although he had studied under liberals like Hermann Gunkel and Adolph Harnack, he too, like Karl Barth, was influenced by Søren Kierkegaard toward dialectical theology. Form critics approach the Bible like any other piece of literature, dissecting it from a purely subjective standpoint. Demythologization builds upon form criticism and further extends the subjective approach to the Scriptures. The underlying premise is that Scripture is filled with myth and must be eliminated because it does not correspond to the modern scientific mind. If the true Jesus cannot truly be known, as Bultmann suggests, what is the benefit of proclaiming the gospel? The true Christian faith is anchored to history and has historical validity; Bultmann’s gospel is a proclamation of myth that offers little hope. “Christianity” is secularization—entering into the problems of the world, trying to solve them through the advantages of science and technology, but without any regard for God. Their “gospel” is man-centered rather than God-centered. concept of sin and atonement for sin is also ignored. OPENESS OF GOD THEOLOGY (Clark Pinnock, David & Randal Basinger, John Sanders, Gregory Boyd, Richard Rice, Robert Brow) Names: Openess Theology, Freewill Theism, Open Theism Man has true free will and God does not control all events. This theology finds its appreciation in Wesleyan, Arminian and Pentecostal circles God’s feelings reveal that may alter his intentions or change (He is not immutable). God has limited omniscience. There are some things that are not known by God for they are not knowable or He allows limited sovereignty. Inerrancy is affected for God does control the future or future prophecy. They infer that God could make mistakes. Opponents of the view: Thomas Oden, D.A. Carson, Norm Geisler, Bruce Ware, John Piper, R. C. Sproul, Albert Mohler, John Frame. Most popular in Central and South America. Focus is on the poor and oppressed (including blacks and women). A theological movement that has attempted to unite theology with an ideology emphasizing social/economic concerns (usually Marxism). See Moltmann’s theology which advocates revolution for future hope. It has borrowed from Kant and Hegel’s philosophy. He found in the Roman Catholic Church in Latin America. The Gospel helps the oppressed. God liberated Israel from oppression in the Old Testament. Jesus came to liberate the oppressed in the New Testament. Christians are to be involved in creating governments. They are to follow the example of Jesus and liberate the oppressed. Church must serve the world through love. Primary focus is on peace, justice, and liberty. Theology is not an academic subject but a revolutionary spirit that endeavors to change the world. FAITH – “Faith in faith” or your “word of faith” produces results. LITTLE GODS – In God’s image we are in God’s class, we are little gods. A belief system emerging from the interaction with culture and ministry. Mark Driscoll paredt company with the emergent organization and would be more conservative. Brian McLaren would be more at the liberal end of the movement. The “emerging church” is more a generic term to indicate a prime mission to reach the postmodern culture with the gospel of Jesus Christ. The “emergent church” is an organization from the Emergent Village founded by Brian McLaren and others. He draws upon a diversity of theologies: Evangelical, liberal Protestant, Orthodox, Roman Catholic and denominations. In practice, many use the terms interchangeably. They adopt more of a relativistic stand on doctrine and are not dogmatic on doctrine. They tend to reject full, verbal plenary inspiration and inerrancy. They see Scripture as “narrative,” which tells us what happened but not what should always happen. In contrast to conservative and liberal views of Christianity, McLaren is missional: To make disciples of Jesus Christ in authentic community for the good of the world. They reject the church of modernism, seeker-sensitive and megachurch. They are postmodern and focus on relationships, love, shared tradition, integrity in discussion. The Jesus of Brian McLaren is an amalgam of Protestantism, Roman Catholicism both liberal and conservative. McLaren rejects the substitutionary death of Christ. Evangelism is very broadly and diversely defined. If Jesus’ death was not a penal substitution and the gospel is broadly and diversely defined then the missional statement seems to be vague, which is typical of the movement. They have tried to engage their culture, but it appears the culture has overwhelmed the emerging church both in method and foundational truth or doctrine.